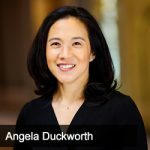 In this 10th episode, Jason talks with Angela Duckworth, Founder & CEO of Character Lab, former advisor to the White House, World Bank, NBA & NFL teams, and author of the new book Grit: The Power of Passion and Perseverance. The two delve into what character and grit are and the steps you can take to improve yours. [2:55] Are we in a crisis of character moment in history? [6:35] Is character an absolute or constantly in flux? [14:28] What is grit and how do you develop it?